Not a single team in the bottom seven of the Premier League table was involved in a draw this weekend. That’s good news for drama, and bad news for their supporters’ blood pressure. Huddersfield Town and Fulham are all but destined for the second-tier Championship – we’ll get to them first – but the race to avoid the final ticket downward should be exciting. ... and here’s how everyone stands after the second weekend of March. Huddersfield Town — Bournemouth is not a pushover, but still, if the Terriers wanted to get serious about staying in the Premier League, a home fixture vs. a mid-table side would have been a nice place to start. Instead, a 2-0 loss means they’re as anchored to the bottom as ever. Fulham — Sitting only three points above Huddersfield, it’s unwise to bet the Cottagers stay up. Of their 21 losses, 17 have been by multiple goals, including Saturday’s 3-1 setback at Leicester City. Scott Parker, Fulham’s third manager of the season, had better start preparing for life in the Championship. But the Reds rallied to win 4-2, keeping them a point off the top and Burnley two points off the drop zone. With two home fixtures coming up, Burnley needs to snap its three-game slide pronto. The Bluebirds now have three weeks off before one of the most brutal stretches imaginable to close the season. They still have to play the Manchester clubs away and both Chelsea and Liverpool at home, not to mention road trips to fellow relegation battlers Burnley, Brighton & Hove Albion and Fulham. Never say never, but Cardiff has some serious work left to do. Brighton & Hove Albion — Brighton’s situation is difficult to predict. On one hand, the Seagulls just earned a crucial 2-1 win at Crystal Palace and have a game in hand. On the other, that game is against Chelsea, and they’re still in the FA Cup, which could be a distraction going forward. Where will Brighton finish? Your guess is as good as ours. 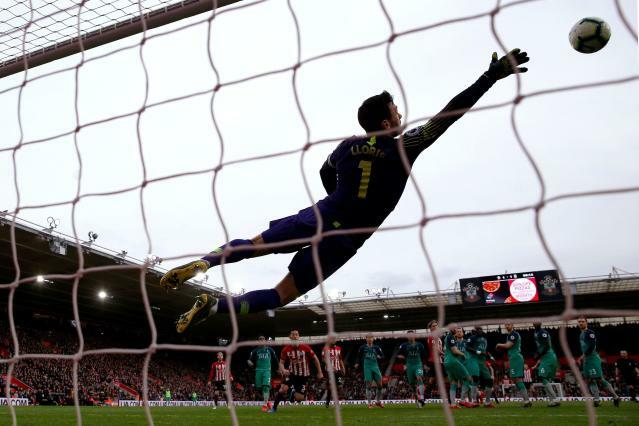 Southampton — Two wins in three for Ralph Hasenhuttl’s men, including Saturday’s 2-1 rally past Tottenham Hotspur, have them headed in the right direction. There’s only one Big Six club left on the schedule, Liverpool at home on April 5, but there are enough tricky fixtures to keep Southampton from getting comfortable anytime soon. Now just three points from 37, generally considered the threshold for safety, Rafa Benitez’s side is nearly there. 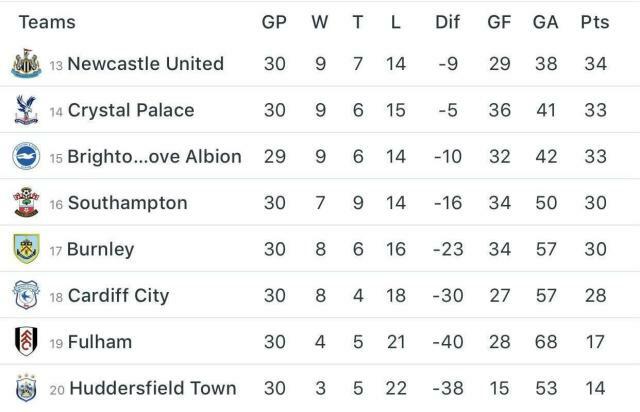 Crystal Palace — The Eagles earned 10 points from five matches over the course of a month. Then they lost at home to Brighton. Watch your step, Palace.